I cook, but I'm a baker at heart. 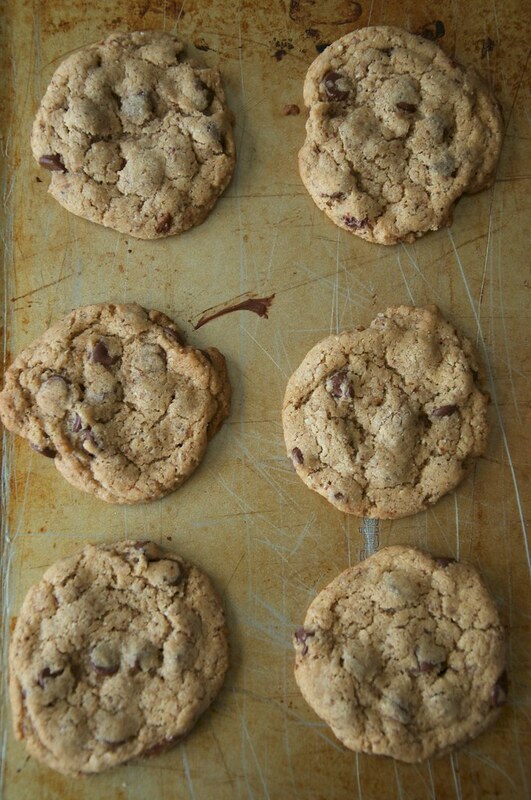 As much as I love eating healthy whole foods, my greatest kitchen achievements and goals revolve around creating crusty sourdough rounds and perfect chocolate chip cookies. Now that we're unpacked in our new (gloriously large) kitchen . . . I'm getting back to my baking. It feels good. I've been working on this cookie recipe for months (years, really). I've discovered that shortening -- though not an ingredient I ever use much -- really helps with texture here. However, if you use all shortening, the cookies lack flavor. Flax eggs work well when using baking soda to lift. White-whole wheat flour gives substance, but keeps the dessert aspect alive. Sea salt just tastes better. It's the little things. Anyway, if you haven't made one of my recipes before, I'd say this is a good one to start with. It's certainly a keeper. And though I'm never quite done tooling around with my confections, I think this one might go down as my official homemade recipe. The one that I'll pass along to my kids and their kids and etc. 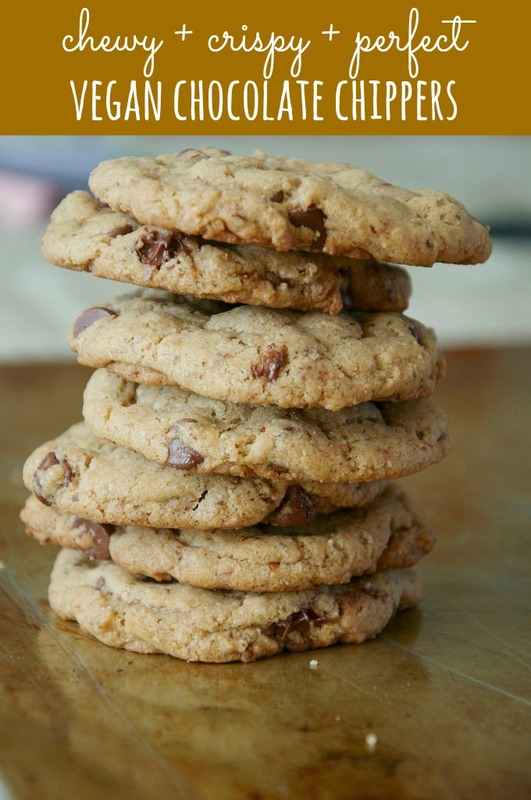 Your new go-to recipe for vegan cookie goodness. * I used a mix of half this amount dark brown sugar + half this amount of raw sugar. Preheat your oven to 375 degrees F. Set out an ungreased baking sheet. Using a paddle attachment in the bowl of a stand mixer, combine the Earth Balance, shortening, and sugar. Mix on medium to high until light and fluffy. Then add in the flax egg and vanilla extract. Again, blend until fluffy at a higher speed -- a couple minutes should do. Add in the flour, almond meal, sea salt, and baking soda. Mix on slow or by hand. Then fold in the chocolate chips. You can add nuts or anything else in this step too, just keep it to around 1 cup total of add-ins. Bake right away or chill in your refrigerator for half an hour -- it's really up to you. I tried it both ways, and I couldn't tell a huge difference with chilling or not. Bake for 9 to 11 minutes (9 does the trick in my oven every time, but all ovens are different). Until lightly brown on edges. Let cool before devouring with some homemade almond milk on the side. I'm hoping to get an initial house tour up on Writing Chapter Three later today so I can show you the kitchen! There's nothing fancy about it. The appliances don't match and aren't particularly new. The countertops are laminate. The cabinets are old and dark. BUT! It's so much bigger and more efficient than my old space. So, from a practical point of view -- a huge upgrade. Oh, and I posted over the weekend. If you're looking to eat less BPA and use fewer canned goods: cooking beans isn't as difficult as I once believed it to be. Here are my tips and tricks, as well as how to freeze 'em in large batches.